The geosites blog is off to warmer climes this week to look at the geology of more sites further afield in the British Overseas Territories. 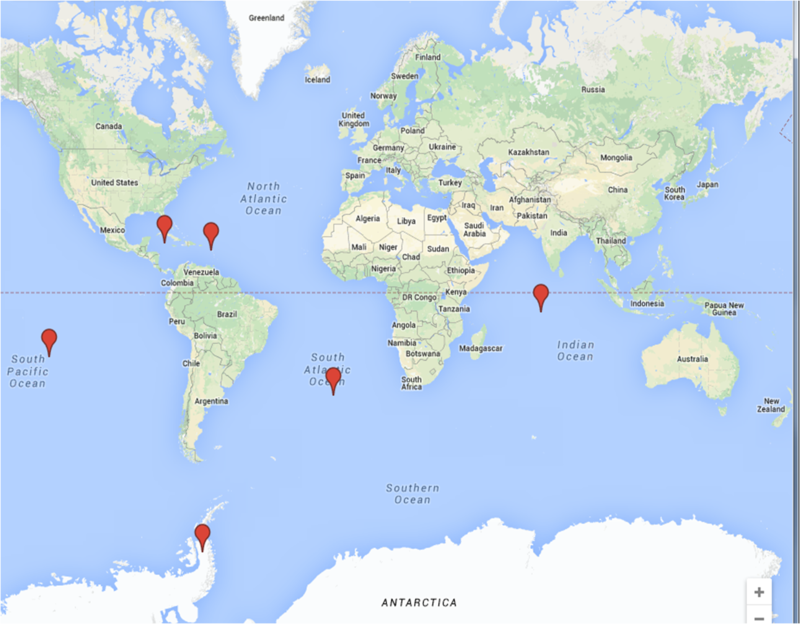 But first, an explainer: what technically is a British Overseas Territory? Well there are 14 territories which are under the jurisdiction and sovereignty of the United Kingdom but they do not form part of it. They are those parts of the former British Empire that have not acquired independence, or have voted to remain British Territories. They all have their own internal leadership but share the Queen as head of state. Here we take you through just a few of them and a brief introduction to their geology. 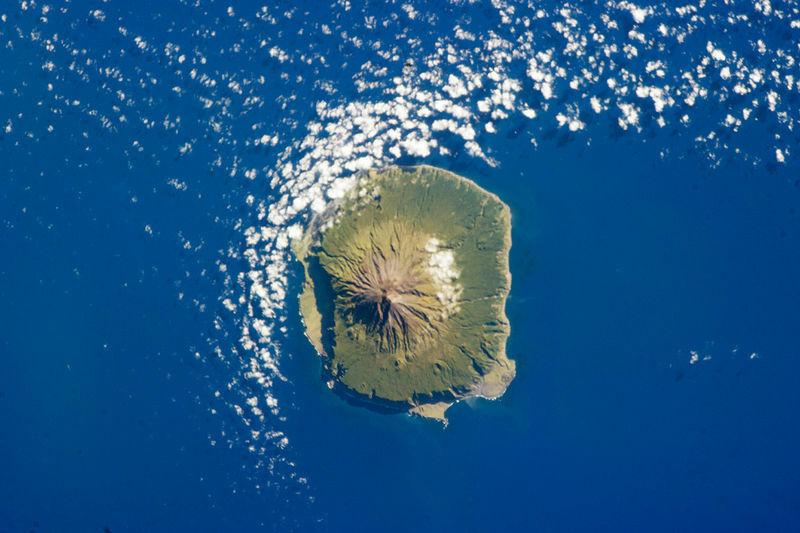 Tristan da Cunha (named after its discoverer, Tristao da Cunha) is part of a remote group of volcanic islands in the South Atlantic Ocean. Despite its proximity to the Mid-Atlantic ridge, the volcanic activity is due instead to a hotspot thought to have formed by an upwelling of mantle, so named the Tristan hotspot. It is the most remote island population in the world. The island is entirely volcanic in origin comprising mostly basantic and phonolitic lava flows and most recently erupted in 1962. Geosite: Visit Queen Mary’s Peak, 2062 metres above sea leve, the peak of the massive shield volcano that makes up the island and see the heart-shaped crater lake sitting at the top. Continuing south to colder climes is the British Antarctic Territory, site of many cutting edge geoscience research projects. With 99% of Antarctia covered in snow and ice the geology is a little harder to find but Antarctia is home to some of the most spectacular mountain ranges including the Antarctic Pensinula, the Transantarctic mountains and the highet mountain, Vinson Massif in the Ellsworth Mountains. 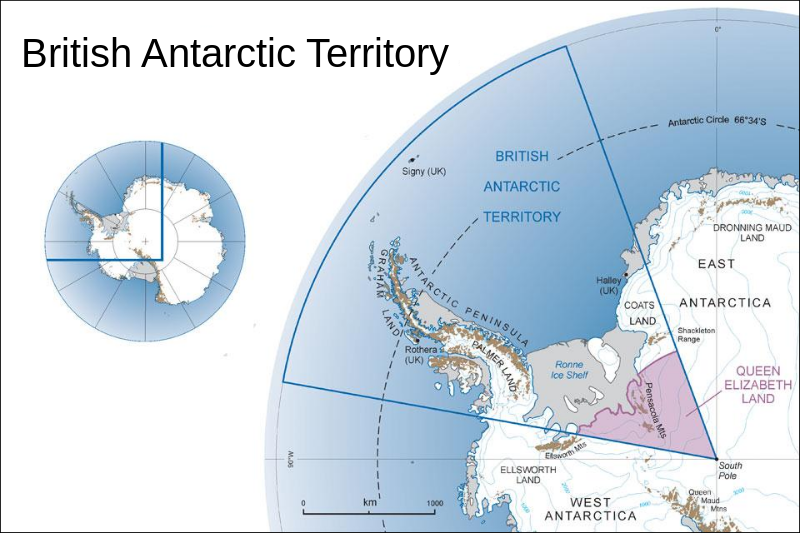 Map of the outline of the British Antarctic Territory. Geological features of Antarctica include Nunataks (small areas of rock emerging above ice sheets and glaciers) and Dry Valleys. Volcanoes are also an important component of the Antarctic region, formed by mantle plumes acting on the stationary Antarctic plate. The region also includes one of the best examples of a long-lived continental margin arc (Antarctic Peninsula), a very young marginal basin (Bransfield Straight) and an oceanic island arc (South Sandwich Islands). Geosite: The Sandwich islands for an excellent example of an oceanic island arc and associated structures and deposits. 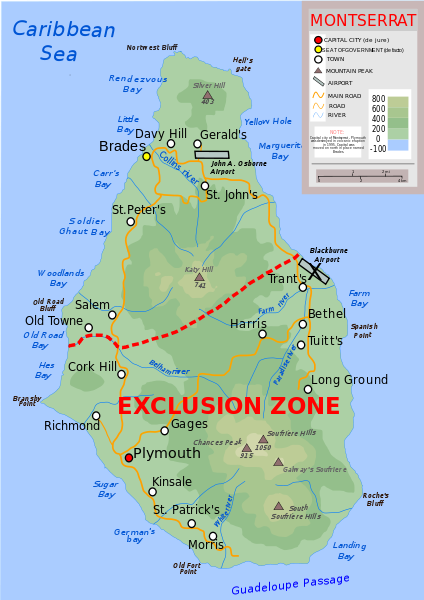 Map of the Soufriere Hill exclusion zone on Montserrat. Montserrat, located in the Caribbean is famous for its volcanic eruptions. Made up of 3 volcanic centres, they date back to the Pleistocene. It is most famous for the Soufreiere Hils Volcanic Eruption that occured in 1995 and 1997. Thought to be dormant for centuries, the volcano destroyed the capital city, Plymouth, the dock, the airport and left most of the southern portion of the island uninhabitable. As such the southern portion of the island has been placed in an exclusion zone and cut off to inhabitants and visitors. The eruption in 1997 consisted of a pyroclastic flows and surges that swept down the north eastern flanks of the volcano. The havoc wrought by the volcano can now be visited by a series of viewing points and boat trips. For more on the volcanic hazards on Montserrat see the BGS website here. Geosite: Montserrat Volcano Observatory where you can see the various hazard monitoring processes going on as well as explanations of the famous eruption. Cayman Trough in the Caribbean. So, next stop is the Cayman Islands in the Caribbean. Located just to the nothwest of Jamaica and the South of Cuba, it is made up of 3 islands: Grand Cayman, Cayman Brac and Little Cayman. These islands are formed of outcrops of the ‘Cayman Ridge’ a submarine mountain range which includes the ‘Sierra Maestra’ mountains of Cuba all the way to Belize. This ridge formed due to the interaction between North American and Caribbean tectonic plates. 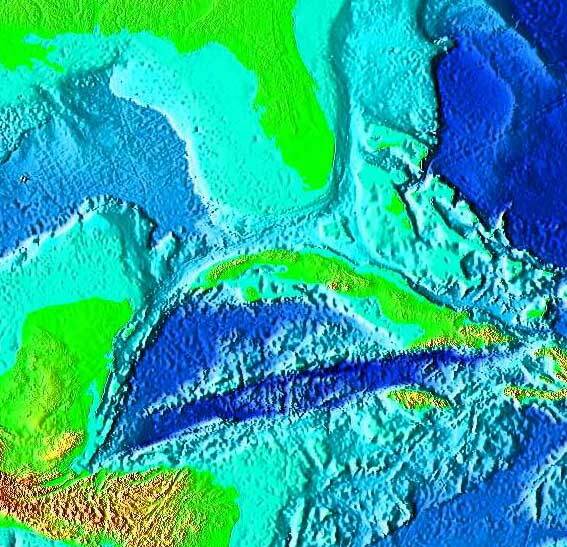 The ridge is the northern margin of the Cayman Trough with these islands formed as individually uplifted fault blocks. They Caymans have a granodiorite at their base, a cap of basalt and an uppermost layer of carbonates formed by living organisms that have been laid down during sea level changes in the last 30 million years. 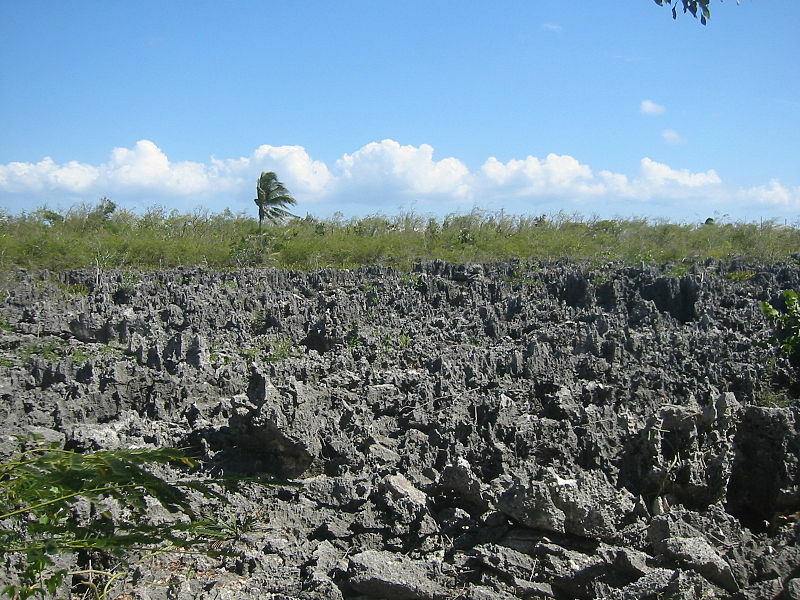 Geosite: A site of particular geotourism value is a place named ‘Hell’ and is located on Grand Cayman. It is a group of short, black, jagged limestone formations formed from the weathered remains of a local rock called ironshore. The black colour is owed to the coating of algae. The Pitcairn islands comprise the islands of Pitcairn, Henderson, Ducie and Oeno in the south pacific. They are the southerneastmost extension of the archipelago of the Tuamotus of French Polynesia. 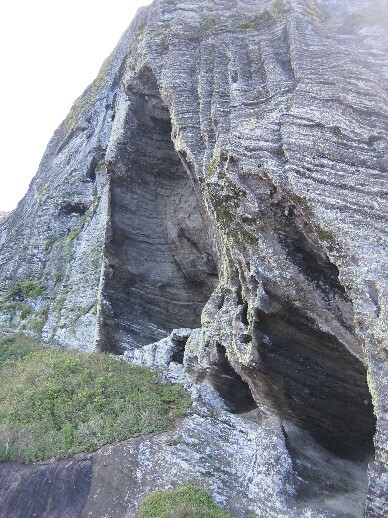 They are formed by a centre of upwelling magma called the Pitcairn hotspot. The predominat geology across the islands is different. Ducie island and Oeno are both atolls, while Henderson island is an uplifted coral island and Pitcarin island is volcanic. Visit Christians cave, along the shoreline, where lead mutineer Fletcher Christian is said to have watched for approaching ships and hid from fellow settlers. 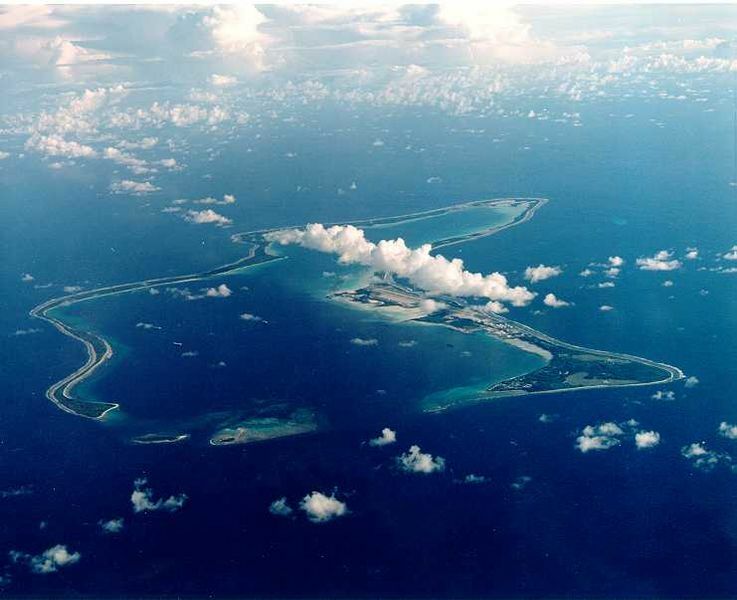 Aerial shot of Diego Garcia. The British Indian Territory (or Chagos Islands) is made up of 6 atolls of the Chagos Archipelago. The biggest of which is Diego Garcia. The Chagos Archipelago sits at the very southern tip of the Chagos-Laccadive Ridge, an enormous submarine range in the Indian Ocean topped by coral reefs and atolls. This submarine ridge is formed by volcanoes above the ‘Reunion’ hotspot. Diego Garcia is the visible rim of a coral atoll made up of Holocene coral and sand which overlays pleistocene limestone deposited on a seamount rising approximately 1800 metres from the floor of the Indian Ocean. The islands and surrounding area form a vast oceanic Environment Preservation and Protection Zone. 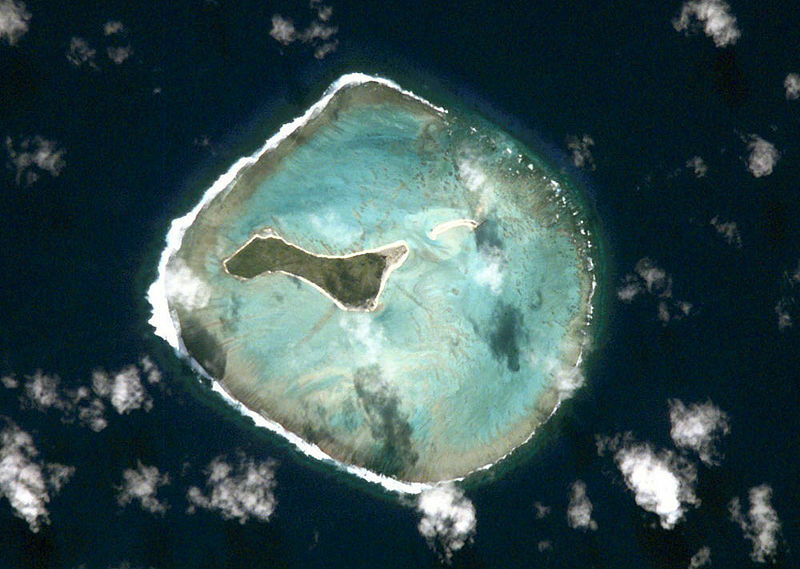 The rim of the atoll almost entirely encloses around a lagoon. Diego Garcia is frequently subjected to earthquakes caused by movememt along the Carlsberg Ridge just to the west of the island, one in 2002 measurig 4.6 on the Richter Scale. Geosite: The Great Chagos Bank, a strict nature reserve, contains habitats such as shallow limestone reef mostly submarine with a few emerging reefs said to be one of the healthiest and cleanest reef systems in the world.